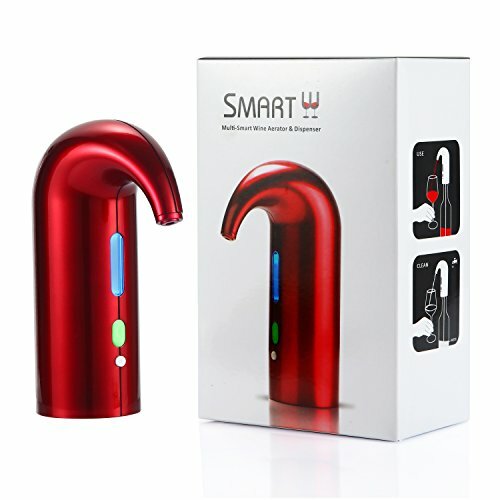 Electric Wine Aerator Wine Oxidizer Dispenser Yollex Rechargeable and Automatic Wine Aerator Pourer Bottle Breather by Magnetic Force Air Decanter Diffuser System(red) by Yollex at Verve Wine Bar. Hurry! Limited time offer. Offer valid only while supplies last. No waiting for mellow wine: With built-in Magnetic force, oxidize device and red-light generator, YOLLEX wine aerator is able to reduce the astringency of the wine in a second. You do not have to oxidize and mature your wine in traditional ways and just enjoy its purity, aroma when it is dispensed into your Goblet. Elegant Design & Quietly Work: Rounded shape design shows the elegant taste of the host and it will dispense and mature your wine super quietly, do not destroy a fine atmosphere. The flexible long tube will reach the edge of the bottom of the bottle, not a drop of wine will be wasted. The Blue-ray visible window can check wine flow to help get accurate amount of wine. USB Rechargeable Aerator: No worry about the poor power the batteries bring, this aerator is with built-in lithium battery, which can meet 100 bottles of 750ml red wine sober after full-charged! Never worry about breaking the button on the top, the button of this wine aerator is on the handle and it is more durable and more easy for you to dispense the wine. Best Gift for Wine Lovers: If you are choosing some kind of gifts for wine lovers, please do not miss this wine aerator.Making it a gift or using it is a good choice for your family or business cocktail party. Commitment to customers: We have confidence with our wine dispenser and we offer 12-month guarantee. If there are any other questions from you, please feel free to contact us and you will be responded within 24 hours. If you have any questions about this product by Yollex, contact us by completing and submitting the form below. If you are looking for a specif part number, please include it with your message.